Today’s “tool”, you may point out, is not really. Truthfully, I didn’t think of bowls as tools until this morning** while I was trying to sneak in a few rounds on a seamless sweater sleeve. I’ve been using this bowl to knit larger projects for so many years without giving it a second thought, it hadn’t dawned on me that it fits nearly all my requirements for a good knitting tool. Namely, that it makes the knitting process easier, more efficient, and therefore, more enjoyable. So that’s my knitting tool for today. Not exactly revolutionary or unheard of and, I am the first to admit, not best described as a “tool”. But it is part of my knitting apparatus that I would not want to do without so there is that. I’d like to promise you more exciting Tools-Days to come, but while I’m fairly certain I shall post again, I had better not promise excitement. Possible future topics include—sit down if you aren’t already—row counters and stitch markers. Some three four months have elapsed since I first stated that I was starting a series of posts about knitting tools and today, at long last, I begin the first in what I hope will become a series of knitting tools posts. In that first post, I mentioned my love of tools in general and my intent to talk about some of the knitting tools I like but don’t often encounter mention of elsewhere (and when I say “elsewhere”, I promise you I have not scoured the internet to confirm). You might be a little sceptical about how this device is any better than just pulling yarn from the center of a ball or using a yarn bowl--the former being simplicity itself and the latter being prettier. To address this question, I’m going to talk a bit about yarn management and the issue of added twist before I get to the actual yarn unwinders. By “yarn management”, I mainly mean how you get your yarn off the ball while you are knitting and, when applicable, how you are taming that ball of yarn. Are you pulling from the center or are you pulling from the outside end? A center-pull ball is kind of self-managed--the beauty of it is that it calmly stays in one spot (for the most part) while you disembowel it. If you are pulling your yarn from the outside end, the ball requires taming or at least a long leash. If it isn’t rolling along the floor or being strong-armed to flip over the necessary number of times to allow you to knit a few more stitches, you are probably using a yarn bowl or some other containment device. Part of the trouble with these aforementioned methods is that unwanted twist is being added to the yarn in the process. (Although, to be more precise, the center-pull ball is definitely twisting the yarn as it is pulled out, whereas the second method of pulling yarn off the outside is a little more unpredictable because it’s usually just taking the path of least resistance which might not always be causing a twist. I find the slipperier the yarn, the more likely it is to just slip off the end instead of unrolling). If you are pulling yarn off the top of a cone, it is like pulling yarn from the center in that it is adding twist (or subtracting, depending). If you require visual assistance, I made this entirely amateur video to try to demonstrate what's happening to the yarn. I finished the blanket without further incident and I’m glad I did because it has gotten a lot of use in the last several years. (In fact, I am currently huddling under it waiting for the weather to realize it's now spring.) My next project was a long cardigan knit from cones and there was no way I was going to risk knitting 1600 yards into an unwearable sweater by pulling the yarn off the top of the cone. Past experience had taught me that a biasing item cannot be fixed with blocking and it won’t end up getting worn more than once. 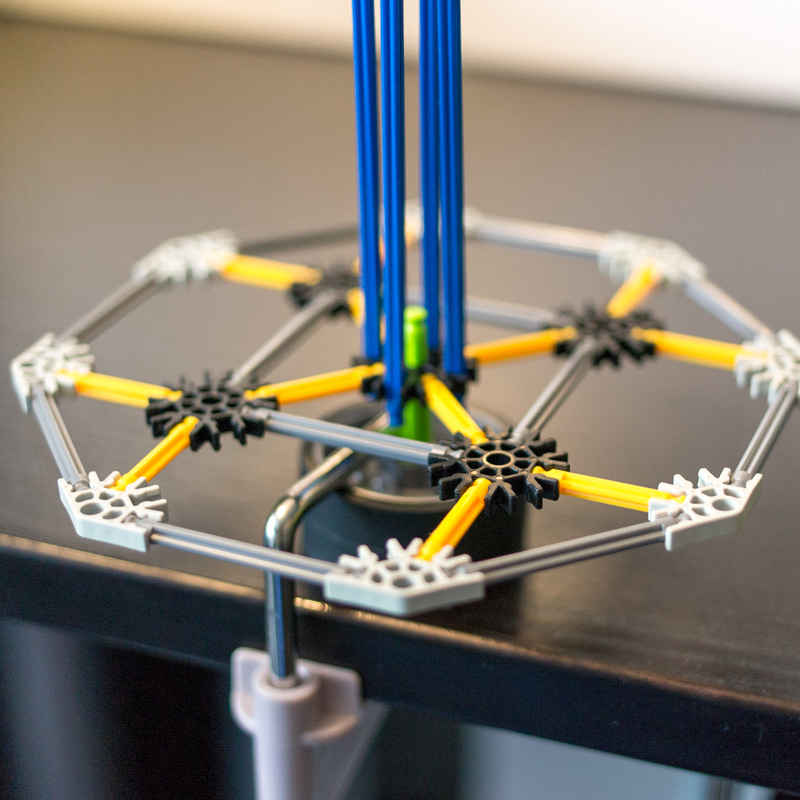 I had to come up with another device (which was basically a cardboard shoe box with a long Sz.13 knitting needle mounted inside) to accommodate the height and weight of the cones because K’Nex is pretty weak when you come down to it. After those two projects, I decided I would never go back to the center-pull ball. Now, I readily admit that countless people have knit an untold number of items successfully with center-pull balls so what I’m fussing about is those other occasions when your yarn keeps kinking up while you knit, or, worst of all, the knitted fabric biases due to the excess twist. This alone is reason enough for me to always use an unwinder, but wait, there’s more! 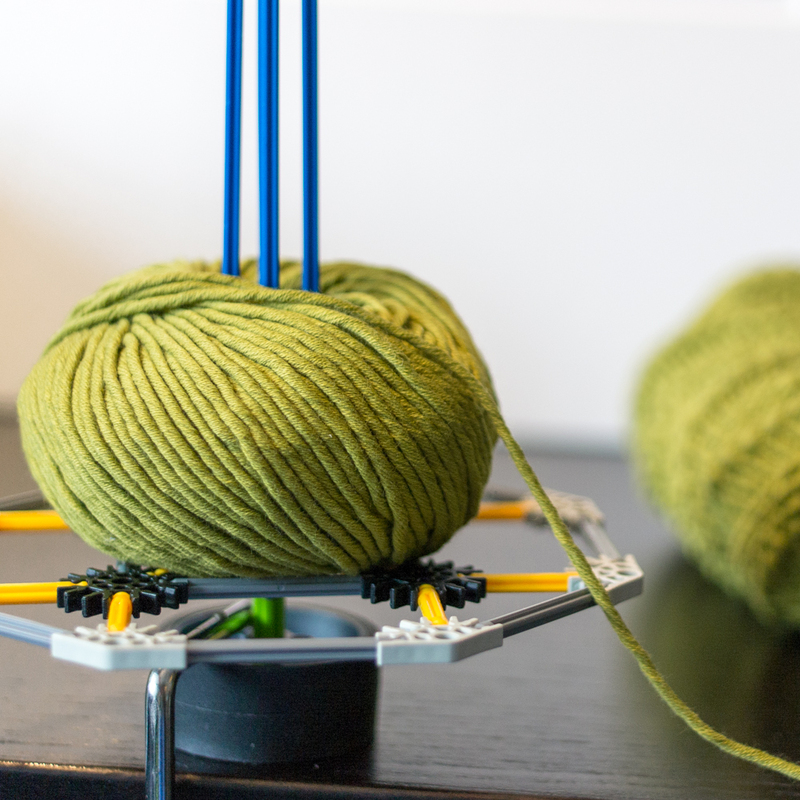 The yarn unwinder should be set on a table or another stable surface and just as importantly, it needs to be at a height level to your hands or a little higher. If you set it lower than your work, you’ll find that the yarn wants to wrap around the post and will not feed smoothly. This shouldn’t be a problem if you get a version with a yarn guide. I have seen versions that have yarn guides built in or as separate attachments. Edited to add: I also recommend placing the unwinder to your right if you carry your working yarn in your right hand and to your left if you carry your yarn in your left hand--it's a small difference, but worthwhile if you find that the yarn isn't feeding smoothly. I recommend purchasing in person or from a vendor with a good return policy. There are a lot of little variations from one manufacturer to the next and you might not find the right one for you if you choose on looks alone. You literally need to be able to “give it a whirl” first! Regarding cost, if this is money you are unwilling to spend but you want to try some version of a yarn unwinder, you have options. I made low-tech and low-cost versions before I discovered I could pay someone to make one out of nicer materials for an amount that I was willing to part with. If you want one for under $15 (USD), the Yarn Valet™ yarn dispenser is available through Knit Picks and Michael’s, and probably others as well. (I haven’t personally tried it out, so I can’t vouch for how well it works but there is a video review here.) If DIY is more your style, you can try hacking various common household items that you might already have or can find at a yard sale or thrift store. On Ravelry, I have seen the occasional mention of empty CD spindle cases, paper towel holders, standing toilet paper holders, and cardboard boxes/plastic bins with a knitting needle or dowel stuck through it. Tech Knitter has a DIY tutorial for a fairly hefty but very functional-looking version here. I’ve tested out a few of these DIY options and it can work pretty well but I would say that generally speaking, it helps if you use something to decrease the friction so the yarn can rotate more readily. For instance, the CD case works better if you can put a large nut (or something like) under an actual compact disc (which I’m going to guess you don’t need anymore in this modern era) and then rest your yarn ball/cake on the disc. If using a paper towel stand or something that does not have the ability to rotate on an axis, I would probably consider winding the yarn around a cardboard tube and then putting it into place. With all these things, you will probably need to weight or clamp the base or else the whole contraption is coming straight at you. Let my dented floor be a lesson to all. If you want to see some of the options for yarn unwinders available, I made this Pinterest board with direct links. It's a short list because I intentionally did not include every last vendor I have seen online, but you can take a look at the first footnote below to find a list of search terms to help you look for other products or DIY tutorials. I may or may not have convinced you that this tool is a necessary one, but personally, I will not be going back to my old ways of the center-pull ball. Yarn unwinders are tidy, efficient, and highly functional, when used properly. It's a tool I wouldn't readily give up and I don't regret a single penny I spent on them, which is more than I can say about my yarn stash. *I am a big fan of standardized nomenclature, as well as useful tools, but I don't run the world. Here's a list of the names I've come across. I wouldn't be at all surprised if there are more. I notice that if you only search one of these names, you don't see all the options available so if you really want to get an idea of what's out there, you'll have to make multiple search-engine passes. **When I call a yarn unwinder indispensable, I speak of personal preference, not universal truth. Please don't blame me if it doesn't change your life. ***I still won't be going back to center-pull balls, but, did you know that if you pull the inside end from a hand-wound ball from the right end, it will actually cancel the twist you added when you wound it? By the "right end" I mean this: if you wound the yarn clockwise around your thumb or a nostepinne (assuming you are looking down at the tip or "north end"), the end that you pull from the center should exit out the south end. If you were to pull the end northwards, you are actually doubling the amount of added twist which is when things could get dicey. Back in the old days as a student with little spending money, I knit quite happily buying only very few extras, just the basic notions like a Susan Bates tapestry needle, a cable needle, and when I was feeling really extravagant, plastic bobbins for colourwork (which got used for exactly one project some 14 years ago and never again). But I would devise little "tools" out of common household objects when I thought of something that would make something easier to do (some worked better than others). Then, with the rise of the internet and the inevitable proliferation of knitting sites (Ravelry, in particular), my eyes were opened wide to the many possibilities out there, both DIY and ready-made. The truth of the matter is that one doesn't need much more than two sticks and string to knit but tools can facilitate certain steps in the process and that often means more efficient and more enjoyable knitting. Who doesn't want that? My first official Knitting Tools-day post will be about yarn holders. I have posted about these before, in a distant time when I thought Tumblr was a good micro-blogging platform. (I lost interest when I realized that I couldn't maintain a blog even on a micro level.) It might seem as though I'm just rehashing old material, but two things: first, I have revised a few of my earlier impressions, and second, trees that fall in the forest that no one hears and all that. Anyhow, all of this is to say that today is not my official first Tools-day. This is my official statement to myself that I'm going to get right on that, sometime. *These accoutrements are not necessarily costly items. Whether you have a hand-carved walnut niddy-noddy or the humble PVC pipe version, it's a tool that helps you wind a skein and it is neither stick nor string. **In addition to executing a task better than it would have been without, a good tool has a civilizing effect on me. And when I'm feeling more civilized, I'm more apt to strive harder for better than "good enough" results and I'm also more likely to have the patience for it if I didn't spend the better part of an hour in a stand-off with a pile of yarn barf. ***Occasional blogging was so much easier than creating real content, which, believe it or not, is still the ultimate plan for this website. But I seem to have a propensity for making plans for the future and keeping them firmly rooted there. ****Which may be for the best because I post secure in the knowledge that no one is actually visiting this corner of the internet. It certainly takes the pressure off.